With another Halloween come and gone, your kiddos will be munching on candy for weeks, and hopefully they can make their goodies last that long. While too much candy in one sitting can hurt their bellies and make them feel ill, there are even worse consequences that can outlast a belly ache. Candy is full of sugar, and sugar can cause huge problems for your children’s teeth. No candy is good for your teeth, but there are some that will cause less harm than others and some you should try avoiding all together. Taking away your kid’s Halloween candy may be hard, especially if you picture the scene from Charlie and the Chocolate Factory when Willy Wonka has a flashback to his childhood, when his father took all of his Halloween candy and told him how it would destroy his teeth. Taking your kid’s candy most likely won’t turn into them creating an entire factory built around candy and having terrible flashbacks of their childhood, but better not to take chances. At Brookside Dental Care, we know what is best for teeth, but we also understand that kids will be kids and you taking their candy away will ruin their entire life. So instead of burning your kiddo’s sweet treats, only allow them to eat one peice each day and make sure they are taking good care of their teeth during the weeks following Halloween, and every week afterwards for that matter. If you want to protect your children’s teeth to help them avoid cavities and other oral issues later on, you can limit the amount of different candies. According to POPSUGAR, it is better to eat multiple pieces of candy all at once than throughout the day, limiting your teeth’s exposure to sugar. So if you kids demand more than one piece, let them have it all at once! Maybe just not right before bed. In this blog, we are not telling your your children cannot have candy. We are just giving parents a heads up about which candies are the worst for your chompers. Read on to learn more about these tasty treats that aren’t as sweet as they taste. Sticky and gummy candy are some of the worst candies for your teeth. This is because they are hard to remove from your teeth and the longer they sit on your pearly whites the more time cavity-causing bacteria has to work. This is how it works—the bacteria in your mouth burns sugar turning it into acid while begins to dissolve enamel. This causes cavities. Since gummy candy can get stuck in your teeth so easily, they are the most harmful in this sense. Some of these gummy and sticky candies can even pull out filling, braces, or even baby teeth that are a bit loose. 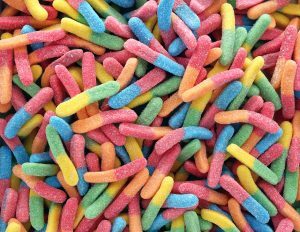 Sour candy offer double the damage to your teeth. They are both sugary and contain acid, which break down tooth enamel. Brushing immediately after eating sour or acidic candy is one thing that should be avoided. Yes, that is right. Don’t brush for at least 30 minutes after eating these candy types. Brushing will spread the acid to more of the tooths surface and increase the risk of enamel breaking down. Sour candy that is also gummy, like Sour Punch Straws, Sour Skittles, or Sour Starbursts should probably be avoided at all costs. However, there is a slight benefit of sour candy. When you eat sour candy, you salivate a little more than usual and according to Know Your Teeth, that saliva helps restore the natural balance of the acid in your mouth. But that doesn’t mean you should go overboard with the sour treats. There is a small bit of good news when it comes to Halloween candy though! Chocolate is one of the better candies for your teeth. 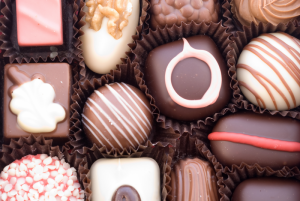 Now don’t go thinking that eating chocolate will make your pearly whites sparkle a bit brighter. Due to the fact that chocolate is not left in your mouth for long periods of time, like gummy candies, it does not cause as much harm to your teeth. They are also a bit healthier than the sugary and fruity candies. So if you have to let your kids eat any candy this Halloween, it should be chocolate. Don’t burn your kiddo’s candy, but make sure they aren’t consuming too much sugar too quickly. And be sure they are taking care of their teeth! For a dental cleaning, schedule an appointment with Brookside Dental Care.